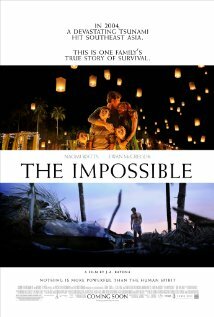 In the superbly crafted and emotionally powerful The Impossible, a film about the Dec. 26, 2004 tsunami, one of the more compelling moments involves not the sharing of medical supplies or fresh water, but a cell phone. As several male survivors huddle amid some ruins somewhere in Thailand, a stranger tells how he had raced the water upstairs to his hotel room – only to find a note from his wife, letting him know they’d gone to the beach. Now he’s clinging to the thought that they somehow survived – and that at some point someone will call his cell phone, informing him of their location. But as a second man shares the story of his own failed search for his wife and one of his sons, the first man offers his phone, even though it risks depleting the cell’s battery and ending his opportunity to receive good news. He watches as the second man contacts a relative, only to collapse in sobs, then end the call, honoring his promise to save the first man’s battery. After a pause, the first man offers the phone again. “You can’t leave it like that,” he tells the distraught caller, who then composes himself long enough to give his relative a more positive promise. This line comes as close as any to summing up the spirit of The Impossible, which features Oscar-nominated Naomi Watts and the equally impressive Ewan McGregor as parents of three children who had taken their family to the Thailand beachside resort for Christmas vacation. Despite its Anglo-Saxon casting, the film is based on the experience of the family of Enrique Alvárez and Maria Belón, the latter of whom is given a writing credit on the film. But director Juan Antonio Bayona repeatedly reminds the audience of the larger devastation, if only as experienced through the eyes of this particular family. While confined to Thailand, Bayona’s film makes it slightly easier to imagine the ultimately unimaginable – how the tsunami killed, according to one U.S. Geological Survey count, 227,898 people. Yet in the face of the humbling and brutal indifference of nature to humanity, the film resists most clichés of the formulaic Hollywood disaster flick. Resisting both apocalyptic anarchy or trite sentimentality, the film convincingly shows people overcoming their own fear, grief and confusion to help others, getting a grip on their own situation in the process. The remarkable ability of human beings, even with their backs to the wall, to set aside their own plight to see the bigger picture makes the film easier to bear – and seeing The Impossible is one way we can do the same.